J/News Articles: J/Thunder "Down Under" Winning Offshore Australia! J/Thunder "Down Under" Winning Offshore Australia! (Sydney, Australia)- The latest report from way “Down Under” is full of great news from many happy owners racing their boats on the east coast of Australia (Sydney, Melbourne, Brisbane) and the west coast of Australia (Perth, Freemantle). Here is the report from Ray and Sandy Entwistle from Sydney. “One of the joys of living ‘Down Under’ is that we get to sail all year round. This past week has seen the end of our Winter Series racing, and commencement of Spring/Summer Series with some great results from our J/Owners from around the country. The ORCV Winter Series is a series of 5 passage races of varying distances, from medium distance races around fixed marks at the top end of Port Phillip Bay, Melbourne to several longer distance passage races to popular destinations for warm hospitality from host clubs, at Blairgowrie Yacht Squadron (BYS), Royal Geelong Yacht Club (RGYC), and Hobson’s Bay Yacht Club (HBYC). Race 5 was to be a Navigators Overnight Challenge where teams were to create their own course by selecting various legs between fixed marks all over the Bay, with the intention of sailing as far as possible in the time allocated, and arrive at the finish line in Hobson’s Bay as close as possible to the finish time of 9:00am on Sunday morning. After four races, J/121 JAVELIN was the series winner of the AMS division, winning the Lord Warden’s Trophy. They scored an impressive 8.0 points across the four races. 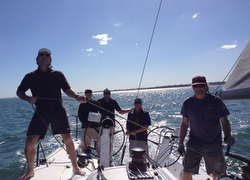 The races were competed in a variety of wind and sea conditions from 5 knots to 25 and flat water to the very choppy, steep waves Port Phillip Bay has to offer. It was a very competitive mixed fleet including an Elliot 15.5, Rachael Pugh 46, Beneteau 47.7, Beneteau 45s, Archambault 40 to name a few. Owner Mark noted “The J/121 performed strongly in all conditions and, as one would expect, really excelled in the broad reaching winds that prevailed for one of the races. It’s great getting to know the new boat. There are many sail selection and trimming combinations, so we’re learning something new in every race.” Congratulations to Mark and his team. On the West coast, the J/122 JOSS commenced the season in fine form winning the “George Law Trophy”. The first Offshore Racing WA (ORWA) race of the 2018/19 season, the “George Law” was sailed in beautiful sunny fluctuating conditions. 29 yachts were a magnificent sight racing from North Fremantle down the channel towards Rockingham/along the beach to Jarvis Bay & then home to Fremantle. 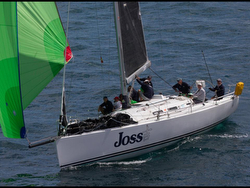 The J/122 JOSS, simply put, had a “great” day battling on the water with Chris Highman on ‘Argo’, Hugh Warner’s ‘Ocean Ranger’ and the Bishop Boys new yacht to WA Offshore Racing ‘Checkmate’. JOSS took home Gold winning IRC Division 1 and 1st in YAH Division 1. On the East Coast, the J/112E ZEST won her inaugural race in Sydney. The Sydney sailing season started with cool overcast conditions (well, cool for us at 15C), and winds about 15kn SSW. 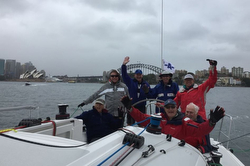 Ray and Sandra from J/Boats Australia joined new J/112E owner Stephen and crew for their inaugural harbour race from Sydney Amateurs Sailing Club. J/112E ZEST was launched just a few weeks ago and Stephen is busy learning the ropes on his new toy. The inaugural race was held with a mix of yachts in the 26ft to 40ft range, and with the winds being from the SSW meant the course was a zigzag across and up the harbour. An overjoyed Stephen was very pleased with the result. There are now four J/112E’s on Sydney Harbour, with plans to get together for some fun ‘one-design’ racing over the summer months. Finally, in sunny Queensland, just like their colleagues around Australia, the J/122 JAVELIN also won their season opening race. On a beautiful Queensland day, blowing 12 to 14 knots from the southeast with a calm sea state, Sally and James’ J/122 JAVELIN powered home to take 1st place on IRC and 2nd on the local PHRF system, against a competitive mixed fleet of yachts ranging from HH42, Kerr 50, Archambault 40’s to Sydney 36’s and Farr 38 to name a few. A great start to the season for them!” Add to Flipboard Magazine.